Summer’s finally here both by the calendar date and the weather! I had a busy week of training with lots of intervals running and riding. I’m slowly starting to feel stronger during these sessions even when I pushed both kids in the Chariot last Friday for some running hill repeats. That was a tough session! I am racing in the Mountain States Cup Crested Butte 40 next weekend so I had to get out for at least one long mountain bike ride beforehand. I set out early Saturday morning and headed over Cottonwood Pass to Gypsum and then up into the Eagle maze of amazing singletrack. 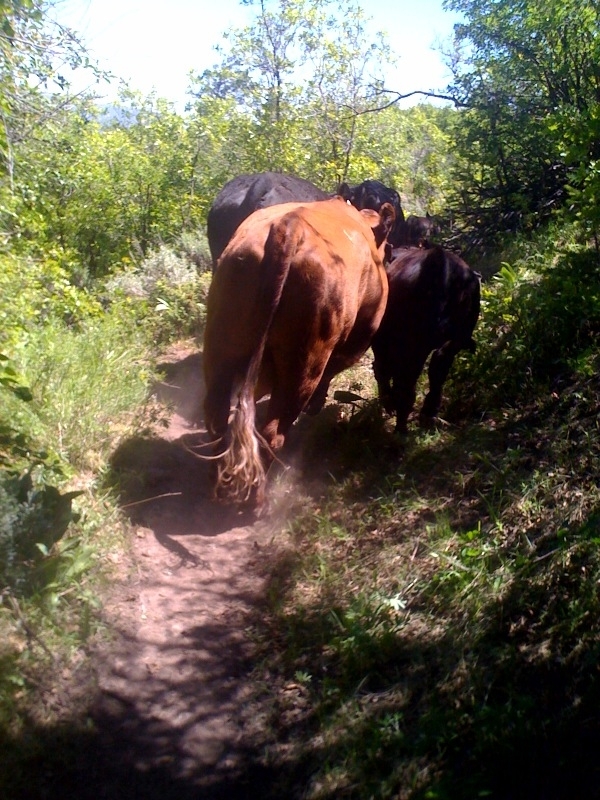 At about three and a half hours of riding, I came up on the tail end of a cattle drive and ended up driving about six cattle back to the group. Just a little smelly. Despite being slowed down by the cowboys, I was able to really enjoy four hours and fifty miles of riding. Sunday was Father’s Day which meant I left early again so Ian could be a father on Father’s Day. Isn’t that what the day is for? Oh well, but it was great of him to let me get out for two plus hours of trail running with Elinor before he enjoyed a long ride. I was amazed how great my legs felt after a hard week of training which gave me more confidence the CTS coaching has been a very good investment. I’m a little (okay, a lot) nervous for the race this weekend. The CB40 is technical and therefor not a fast forty miler. My ride on Saturday was the longest in ten months (and the longest I have left Axel so far). What if it takes me six hours to finish? Will I be able to make it without stopping to nurse? I raced for five days when Juniper was five months old but hadn’t done a race this long this early in the game.